Actress Preity Zinta is all set to co-star with Sunny Deol in the much-delayed film Bhaiyyaji Superhitt, reports Mumbai Mirror. The duo will share screen space after 15 years. They last featured together in the 2003 film The Hero: Love Story of a Spy released. 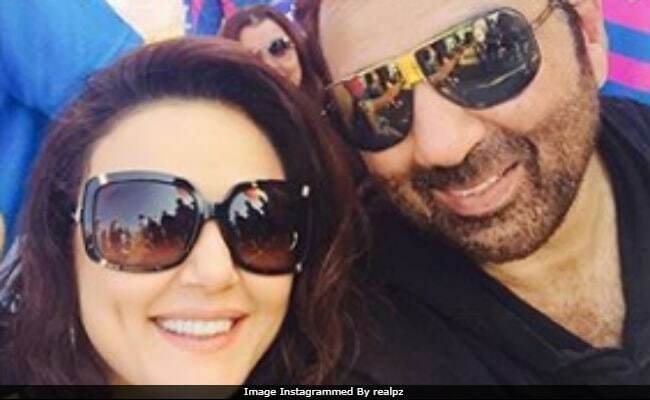 Preity and Sunny Deol will be filming a special song at a studio in Mumbai and it will reportedly be a romantic number. Mumbai Mirror reports that Bhaiyyaji Superhitt was announced seven years ago and Preity shot the last schedule of the film in April 2016, right after her marriage. Preity married businessman Gene Goodenough in an extremely private ceremony, attended by only family members, in February 2016. Gene is based out of US. The actress is celebrating her 43rd birthday today. Preity celebrated her birthday last night with Salman Khan, Bobby Deol (Sunny Deol's brother), Sonakshi Sinha and Iulia Vantur. "Thank you all for all the wonderful birthday wishes. So humbled and so touched by all the good wishes. Loads of love!" she wrote. She has worked with Salman and Bobby Deol previously. Thank you all for all the wonderful birthday wishes So humbled and so touched by all the good wishes Loads of love ! Muaah #aboutlastnight #unplannedgettogether #friendsforever ! Preity Zinta has co-starred with Bobby Deol in films such as Farz, Heroes and The Hero: Love Story of a Spy, which released in 2013. In Bhaiyyaji Superhitt, Sunny Deol plays a gangster from Uttar Pradesh, who aspires to be an actor. Ameesha Patel, Arshad Warsi and Shreyas Talpade are also part of the film. Sunny Deol and Ameesha Patel are co-stars of Gadar: Ek Prem Katha. Preity Zinta has not made any big screen appearances after 2013's Ishkq In Paris, which she also produced while Sunny Deol was last seen in Poster Boyz, starring Bobby Deol and Shreyas Talpade.